President Wilson had not waited until the actual Declaration of War before setting Uncle Sam's house in order for the inevitable conflict. On March 26, 1917, the President had issued an order increasing the enlisted strength of the U. S. Marine Corps to 17,400 men, the limit permitted under the law. On March 29, 1917, 103 Ensigns were graduated from the Annapolis Naval Academy three months in advance of the customary graduation, and on April 6, 1917, when war was declared, the Navy was mobilized. All the radio stations in the country, commercial or amateur, were at once seized. A wireless message was flashed from the Arlington station, notifying all American ships at foreign stations and the Governors and Military posts of America's insular possession in the Pacific and in the Antilles that a state of war existed. War zones were established along the whole coast line of the United States and a series of local barred zones extending from the larger harbors in American waters were indicated. All these harbors were barred at night to entering vessels in order to guard against surprise attacks from German submarines. The Naval Militia of all the states, as well as the Naval Reserves of the Coast Guard Service, were placed at the disposal of the Navy Department. The Naval Militia, numbering 584 officers and 7933 men, were at once assembled and assigned to coast patrol service. There were 361 war vessels of all classes ready for service, including twelve first-line battleships, 25 second-line battleships, nine armored cruisers, 24 other cruisers, 50 destroyers, 16 coast torpedo vessels, 17 torpedo boats, 44 submarines, 8 tenders to torpedo boats, 28 gunboats, 4 transports, 4 supply ships, 1 hospital ship, 21 fuel ships, 14 converted yachts, 49 tugs, and 28 minor vessels. The enlisted strength of the Navy was 70,000 men, in addition to 8500 members of the Naval Militia. It was estimated that, for the complete mobilization of the Navy, 99,809 regularly enlisted men and 45,870 reserves, were required. Of these, some 27,000 were needed for coast defense, while 12,000 were available for service at the various shore stations. All retired officers of the Navy were summoned for duty. A call for 35,000 men to the Navy brought volunteers in flocks to the colors. A large fleet of mosquito craft was organized to patrol the Atlantic Coast, keeping on the watch for submarines. A Coast Patrol Fleet was organized on March 31st under the command of Capt. Henry B. Wilson. Contracts had been awarded for the construction of 24 destroyers before war was declared, and additional destroyers were now being built. Before the outbreak of the war, 123 new naval vessels were under construction. Immediately after war was declared, contracts were made for building 949 new vessels. All vessels in American harbors of 2,500 tons or more dead weight were requisitioned. More than 800 craft were taken over and converted into transports, patrol service boats, submarine chasers, mine sweepers, and mine layers. So rapid was the Navy's expansion that, before Jan. 1, 1918, there were 245,207 men enrolled in the Regular Navy, 54,000 in the Reserve Force, 16,500 men and 856 officers in the Naval Volunteer ranks. The Marine Corps had similarly been expanded from a force of 13,266 men to a total strength of 70,527 men and 2,435 officers. The U. S. Government seized 109 German ships, aggregating 629,000 gross tonnage, which were lying in American ports. Of these, 27 were moored in New York Harbor, including the Vaterland, George Washington and Kaiser Wilhelm II. Six were in Boston Harbor, including the Amerika and the Kronprinzessin Cécile. Many German vessels were held in the Philippines and at Hawaii. Seven Austrian vessels also were seized, but subject to payment. In addition, all ships being built on private contract or for neutral nations were commandeered. Other neutral vessels were secured by arrangement. The German officers and crews were interned for the period of the War. Many of the German ships had been purposely damaged before being turned over to the Government, but they were quickly repaired, given new names and put to sea under the American flag. Federal officers had rounded up and sent to Federal prisons many German spies. Some already had been convicted of complicity in German plots and were at liberty on bond pending decision on their appeals; others were under indictment and awaiting trial; many more suspects had long been under strict surveillance. 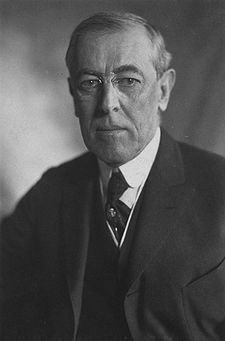 By proclamation, President Wilson warned all citizens and aliens against the commission of acts of treason, while assuring German civilians and German Reservists domiciled on American soil that they would be free from molestation if they conducted themselves in conformity to the law. Suitable precautions were taken against any uprisings by German sympathizers. During this crucial period the nation was afflicted with spy fever in its most virulent form, and many loyal persons were unjustly accused of pro-German sympathies. Naval camps sprung up in a night at various points along the Atlantic and Pacific Coasts, notably at League Island, Newport, Cape May, Charleston, Pensacola, Key West, Mare Island, Puget Sound, Hingham, Norfolk, New Orleans, New York, Great Lakes, Pelham, Hampton Roads and Gulf port. Schools in gunnery and engineering were established, where men were trained not only for the Navy but for the Merchant Marine as well. Special attention was paid to the training of gunners in submarine attack, resulting in greater efficiency. Four weeks after the Declaration of War, a squadron of American destroyers, under the command of Admiral William S. Sims, reported for service at Queenstown, at once co-operating with the British Fleet in patrolling the submarine zone. While en route to England, one of the destroyers conveyed a large Atlantic liner through the danger zone. With the arrival of the American Fleet the Allied losses by German submarine attack began steadily to diminish.